Aftermarket Simplicity Belt at Discounted Prices and $7.95 Flat Rate Shipping. 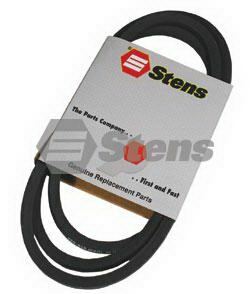 This Belt Replaces Simplicity 108209 and Fits Models: SIMPLICITY 4000, 6000, 7000 series, pre-1980 Landlord, pre-1980 Sovereigns, 6000 series, 400 series 1993 Cornes. Application: Spindle Length: 82" Width: 1/2"
Aftermarket Simplicity Lawn Mower Belt Replaces SIMPLICITY 163011. Fits Models: SIMPLICITY 700, 800, 900, 1800, 6000, 7000, GTH-L pre- 1980 Sovereign models Application: Drive Length: 71 1/2" Width: 1/2"
Description: OEM SPEC BELT SIMPLICITY / 1656960 Replaces (OEM): SIMPLICITY 1656960 Fits Models: SIMPLICITY 5000, 600, LTH, 1600, 1700, 500, 900 series, pre-1980 Broadmoor, pre-1980 Landlord, pre- 1980 Sovereigns Application: Transmission Length: 84 1/4" Width: 1/2"
Description: OEM SPEC BELT SIMPLICITY / 1657044 Replaces (OEM): SIMPLICITY 1657044 Fits Models: SIMPLICITY 14 and 16 GT series, 1700 series, GTH-L series, 7000 series Application: Transmission Length: 93 1/8" Width: 1/2"
Description: OEM SPEC BELT TORO / WHEEL HORSE/94-2501 Replaces (OEM): SIMPLICITY 1664644 Application: Drive Length: 103" Width: 1/2"
Description: OEM SPEC BELT SIMPLICITY / 1716854 Replaces (OEM): SIMPLICITY 1666698 SIMPLICITY 1716854 Fits Models: SIMPLICITY 500, 1600, 4000 LTH, RT, Broadmoor series Application: Drive Length: 90 1/2" Width: 1/2"
Description: OEM SPEC BELT SIMPLICITY / 1666801 Replaces (OEM): SIMPLICITY 1666801 Fits Models: SIMPLICITY GTH-L series, 700, 900, 7000 series, pre-1980Landlord, pre-1980 Sovereigns, 1993 Sovereigns Application: Engine to Deck Length: 79 1/2" Width: 1/2"
Description: OEM SPEC BELT SIMPLICITY / 1668066 Replaces (OEM): SIMPLICITY 1668066 Fits Models: SIMPLICITY 5000 and 6000 series 42" cut Application: Blade Length: 120" Width: 1/2"
Description: OEM SPEC BELT SIMPLICITY / 1670835 Replaces (OEM): SIMPLICITY 1670835 Fits Models: SIMPLICITY 600, 4000, 5000, 5200 series, pre-Broadmoor models Application: Drive Length: 78 1/2" Width: 1/2"
Description: OEM SPEC BELT SIMPLICITY / 1672135 Replaces (OEM): SIMPLICITY 1672135 Fits Models: SIMPLICITY 5000 and 600 series, pre-1980 Broadmoor series Application: Hydro Length: 80 1/4" Width: 1/2"
Description: OEM SPEC BELT SIMPLICITY / 1703466 Replaces (OEM): SIMPLICITY 1665638 SIMPLICITY 1703466 Fits Models: SIMPLICITY GTH model, 48" deck Application: Blade Length: 126" Width: 1/2"
Description: OEM SPEC BELT SIMPLICITY / 1703836 Replaces (OEM): SIMPLICITY 1703836 Fits Models: SIMPLICITY LTH series, 1600 series, 14 and 16 GT series and 1700 series Application: Spindle Length: 91" Width: 1/2"
Description: OEM SPEC BELT SIMPLICITY / 1713515 Replaces (OEM): SIMPLICITY 108508 SIMPLICITY 1713515 Fits Models: SIMPLICITY 7100 series, Allis Chalmers 900 series Application: Engine to Deck Length: 78" Width: 1/2"
Description: OEM SPEC BELT SIMPLICITY / 1713549 Replaces (OEM): SIMPLICITY 1713549 Fits Models: SIMPLICITY Homesteader 6 HP model year 71-74; 30" tiller Yeoman; 36" rotary mower arbor drive; Broadmoor 5000, 3008 series Application: Drive Length: 70" Width: 1/2"